The Community of Tiree saw 2017 in in style with a very successful dance held in An Talla! 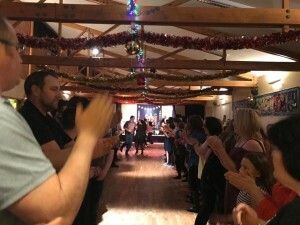 Tiree Trust have been ru nning the annual community Hogmanay dance for the past three years and we are pleased to report that this year’s event was the busiest yet, with over 170 people in attendance! We had excellent music from the talented Dùn Mòr Ceilidh Band who kept us entertained throughout the night – the dance floor was never empty for long! Dùn Mòr is led by Tiree locals Eilidh MacFadenjoyeyen on accordion and Jamie MacDonald on fiddle. Mairi Innes is the drummer and also provides vocals, Micheal Steel on whistle and pipes making up the four-piece band! There was an excellent mix of young and older, locals and visitors who all enjoyed bringing in New Year together! There was excellent music and plenty of dancing and of course a raffle! We would like to thank everyone for coming along to the event and we hope you it! Many thanks to all who helped with the tidy up at the end of the night and to those who generously donated raffle prizes!